MEMBERS OF Glasgow’s Ahmadiyya Muslim community are ‘readjusting’ to life following the death of shopkeeper Asad Shah.Almost one month after the shopkeeper’s death, Ahmadi leaders said community members were “healing over time” and added that police reassurances had helped them feel safe.Abdul Abid, President of the Ahmadiyya community in Scotland, made the comments at the launch of a two-week bus campaign against extremism. He said: “The wounds are being healed with the passage of time.”Hopefully people will be back to normal soon.”With reassurances from the authorities and the steps taken by them, it’s also helping.”We are moving toward normalisation.”Politicians from and religious leaders from faiths including the Church of Scotland, Catholic church, Jewish and Sikh communities joined Ahmadi leaders yesterday to launch the campaign in George Square. A fleet of 50 buses, with the slogan “United Against Extremism” on their side, will be touring the city over the next two weeksEdinburgh and Dundee will also have 25 buses with the same message.The campaign had been intended to launch later this year however organisers brought it forward following the attack on Mr Shah on March 24.Mr Abid added: “This is part of a larger campaign throughout the United Kingdom. Superintendent Jim Baird of Police Scotland’s Safer Communities also attended the event and said the number of hate crimes reported since Mr Shah’s death has stayed relatively stable in Scotland.He said: ” We have to move forward and we are an open welcoming society with everyone free to worship their own faith and push extremism out to the margins, where it should be. 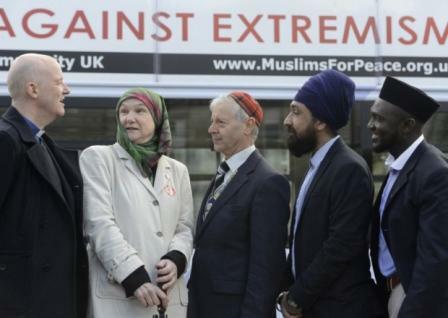 Share the post "United Against Extremism: Glasgow religious leaders come together in wake of Asad Shah murder"